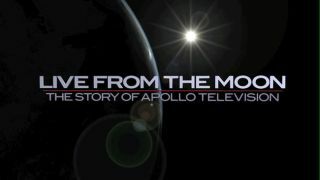 Title frame from Spacecraft Films' "Live from the Moon: The Story of Apollo Television." In the newdocumentary, "Live from the Moon: The Story of Apollo Television",astronaut and capsule communicator (CAPCOM) Joe Allen ponders out loud whatGalileo, Kepler and Newton might have made of the news that humans had traveledinto space. "Theywould think it might be possible," expounds Allen. "If we would thentell them that we humans had captured images, where the motion was captured aswell, they would think that's a miracle." It is the storyof that "miracle" that director Mark Gray set out to tell in "Live from the Moon." "Noone has really told the story of the television - how it was accomplished, whatit showed and represented - the unique nature of a world traveling along on agreat voyage of exploration," explained Gray in an e-mail interview with collectSPACE.com. "I felt as though we were in a unique position to tell that story." Gray,through his company Spacecraft Films, was the first to compile the completerecord of Apollotelevision transmissions and offer them on DVD. For seven years, his focuswas locating, remastering and restoring NASA footage from both the agency'svaults and the National Archives. Spacecraft FIlms' DVDs have become the go tosource for early space program video, used by NASA and many of the recentyears' space documentaries. Several ofthe DVDs included documentaries produced by Gray, but "Live From theMoon" was the most extensive. "Themost challenging aspect has actually been focus," shared Gray. "Thestory of Apollo television leads to so many stories it is painful to cut. Thereare some really good aspects of the story that just couldn't make the cut, butwill surface in some other way, either online or later through a DVDrelease." What madeit in to "Live from the Moon" tells how for the first time in historymillions of people could share, in real time, the experience of frontierexploration. "Placinga manon the moon and returning him safely to the Earth was hard enough in1969," explains Gray. "'Live From The Moon' tells the story of howtelevision, still a technological toddler, was developed for space flight, andexamines the impact of the iconic passages that were returned." Includedare never before seen images from the first test of the lunar surfacetelevision cameras, as well as rarely seen footage from the tracking stationsthat received the signal from the Moon. "'LiveFrom The Moon' also tells the story of television many didn't see, from thelater Apollo lunar missions, and how quickly the American people turned awayfrom the telecasts of one of the country's greatest triumphs," Graycontinued. To tellthat story, Gray literally circled the Earth, shooting interviews at the deepspace communication stations in California and Australia, as well as at spacefacilities and museums in Houston, Baltimore, Los Angeles, Princeton, KennedySpace Center, Huntsville, Ala., Washington, DC and Weatherford, Oklahoma. Along theway, he interviewed astronauts, flight directors, mission controllers, trackingstation operators, historians and those who built the television cameras forthe space program. In addition to Dr. Allen, "Live from the Moon" istold with the insightof moonwalker Alan Bean; Apollo 10 commander Tom Stafford; flight directorChris Kraft; Neil Mason, who drove the Parkes Telescope; Westinghouse camerateam leader Stan Lebar; and the voice of mission control Jack King, amongothers. "Everysingle one of them believed that the TV was one of the most important legaciesof Apollo. And many of them admitted candidly that they didn't give the TV muchthought during the actual missions," recalled Gray. That thetelevision was an afterthought would have been of no surprise to those whofollowed Galileo and Newton, who dreamt of Moon missions before they werepossible. "Someonemade the point... that even though many science fiction stories foretold man'sfirst journey's to the Moon, none included the Earth watching on television. Ofall the times to be alive, I think of witnessing the Apollo televisiontransmissions live as quite an honor. It was a magic time, and the story of howit was accomplished is worthy of being told," said Gray. "Livefrom the Moon" will premiere at Spacefest in San Diego on Saturday, Feb.21. Spacecraft Films is currently developing distribution agreements in boththe US and worldwide for a wide-release timed with the 40th anniversary of thefirst manned lunar landing this July. Click toview an exclusive HD trailer for "Live from the Moon" atcollectSPACE.com. Copyright 2008 collectSPACE.com. All rightsreserved.